Can be edited for younger or older learners. Lots of animations. 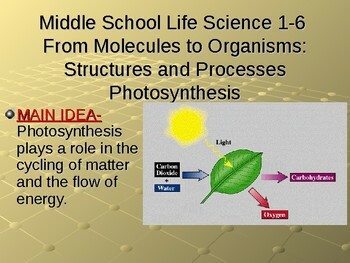 MAIN IDEA- Photosynthesis plays a role in the cycling of matter and the flow of energy. 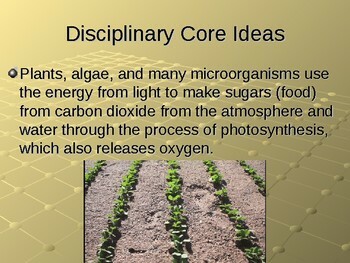 Plants, algae, and many microorganisms use the energy from light to make sugars (food) from carbon dioxide from the atmosphere and water through the process of photosynthesis, which also releases oxygen. 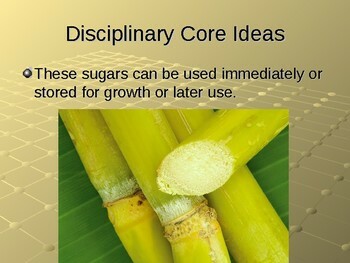 These sugars can be used immediately or stored for growth or later use. The chemical reaction by which plants produce complex food molecules (sugars) requires an energy input (i.e., from sunlight) to occur in a reaction. Carbon dioxide and water combine to form carbon-based organic molecules and release oxygen. Photosynthesis-the process by which green plants and some other organisms use sunlight to synthesize foods from carbon dioxide and water. Photosynthesis in plants generally involves the green pigment chlorophyll and generates oxygen as a byproduct. Chlorophyll-a green pigment, present in all green plants and in cyanobacteria, responsible for the absorption of light to provide energy for photosynthesis. Chloroplasts-one of the parts in a plant cell that contain chlorophyll and where the energy from the light of the sun is turned into food by photosynthesis. Plants, algae, and photosynthetic microorganisms require energy (in the form of sunlight) and must take in carbon dioxide and water to survive. Molecule-the smallest particle of a substance that retains all the properties of the substance and is composed of one or more atoms. Energy from sunlight is used to combine simple nonfood molecules (carbon dioxide and water) into food molecules (sugar) and oxygen. These molecules can be used immediately or stored by the plant. Unused sugars in plants are stored as starch. Starch is considered to be a complex sugar. Starch is used for energy storage in plants and can be found in tubers, like potatoes and yams, corn, and legumes. Animals take in food and oxygen to provide energy and materials for growth and survival. Other animals, which have themselves eaten photosynthetic organisms. 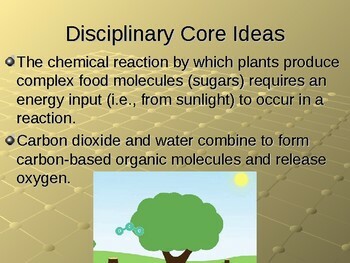 Plants, algae, and photosynthetic microorganisms take in matter (in the form of carbon dioxide and water) and use energy from the sun to produce carbon-based organic molecules(food). Which they can use immediately or store, and release oxygen into the environment through photosynthesis. Plants use the food they have made for energy, growth, and other necessary functions (e.g., repair, seed production). 1. Eating photosynthetic organisms (or other organisms that have eaten photosynthetic organisms), thus acquiring the matter they contain, the production of which was driven by photosynthesis. 2. Breathing in oxygen, which was released when plants used energy to rearrange carbon dioxide and water during photosynthesis. Because animals acquire their food from photosynthetic organisms (or from other animals that have eaten those organisms). Their oxygen from the products of photosynthesis, all food and most of the oxygen animals use for life processes are the results of energy from the sun driving matter flows through the process of photosynthesis. The process of photosynthesis has an important role in energy and matter cycling within plants. (i.e., the conversion of carbon dioxide and water into complex carbon-based molecules (sugars) and oxygen, the contribution of sugars to plant growth and internal processes) as well as from plants to other organisms. Photosynthesis plays a role in the cycling of matter and the flow of energy.